Made by Artisan Biscuits, a family bakery in Derbyshire, England. The bakery was established in the early 1930s and in that time, the world has changed dramatically: but in the bakery, the way they bake biscuits has barely changed. Heart & Flour crackers are a pure, honest, hand-crafter cracker range, made from the highest quality ingredients. Grains milled to just the right coarseness. Pure, rich butter, fruit and nuts that delight the taste buds. 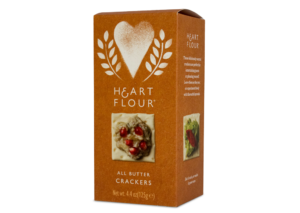 Heart & Flour All Butter crackers are deliciously creamy with a mellow flavour- perfect topped with a thick slab of farmhouse cheddar. Grains milled to just the right coarseness to create these bright pink crackers. 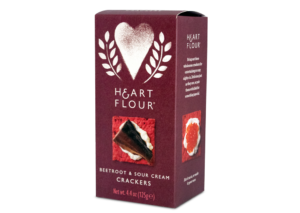 Packed full with beetroot and the slightly tangy taste of sour cream that delights the taste buds. 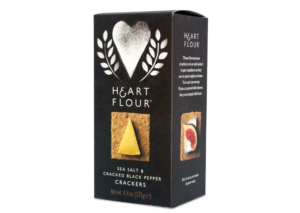 Heart & Flour hand-crafted crackers made from the highest quality ingredients are packed with sea salt and cracked black pepper to create this classic taste. These hand crafted crackers are the perfect combination of fruit and nut. Juicy sultanas and crunchy hazelnuts are combined to create this delicious combination.